Have you ever had one of those dishes that’s so familiar, and such a family staple, that it’s a given at every family meal? Like you begin to associate with certain holidays or certain family members? 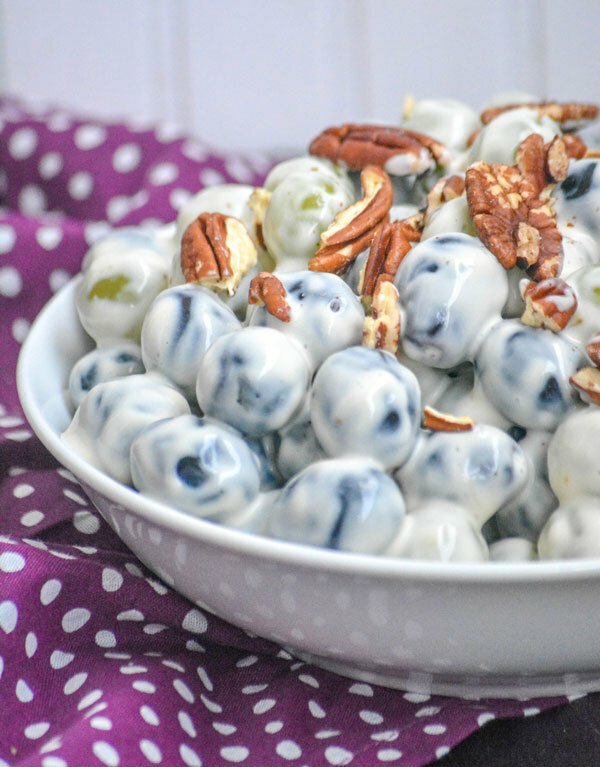 For me, that has got to be my Grandma’s recipe for this scrumptious Sweet Southern Sour Cream Grape Salad. I’m not 100% sure that it’s entirely a Southern thing. I’m pretty sure grape salad is fairly common wherever you go. I do know though that my Grandmother was from Long Island and was only introduced to the idea when she married a man from the deep end of southern Georgia. 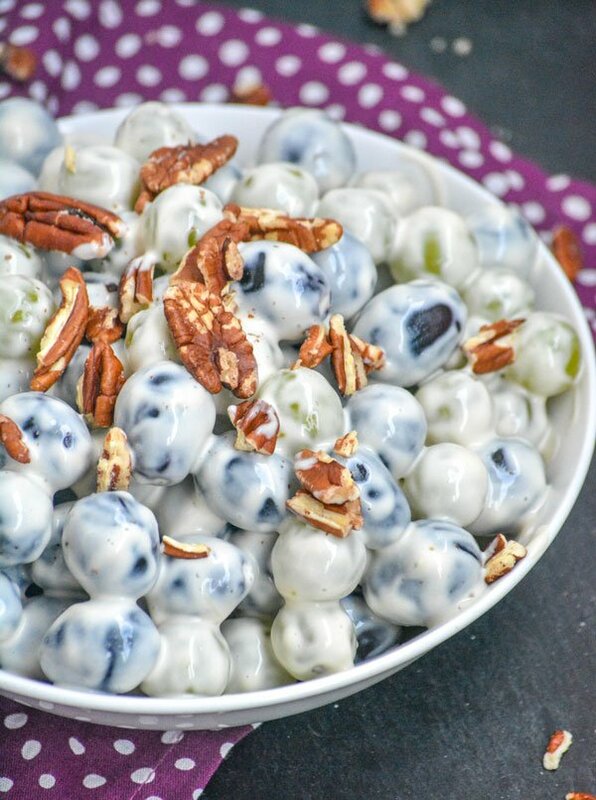 I was surprised at the sweet, tangy combination of this ‘salad’, when I was a kid, but didn’t really question it- just loved it for what it was. And, of course, because my Grandma made it. Anything from her kitchen was golden in all our books! I could easily pick out most of the ingredients, both by sight and (as I got older) by their flavor. Helping in her kitchen, an extremely special treat, also gave me some insight. But I could never figure out where the bit of sweetness came from. I mean, I love sour cream-use it on probably too much stuff- but one thing it isn’t, not even remotely is sweet. What was her secret ingredient?! That my friends, was a carefully guarded secret. I don’t know if it’s my own sense of nostalgia or not, but vintage recipes tend to catch my eye & tickle my fancy, so when I found my Grandma’s recipe in her recipe box a couple years ago- I knew at some point I’d be making it. 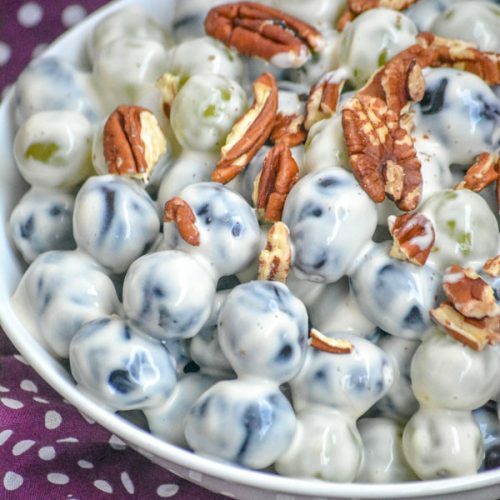 Not only to bring to the next family barbecue, but also to share with you guys. What I also surprisingly learned, was the very common, almost boring, ‘secret’ ingredient. Yep, that was it, brown sugar y’all. I’ve since tried it with the regular granulated stuff, and I can tell you that it really does make all the difference! This recipe is perfect for when the warmer months roll around. 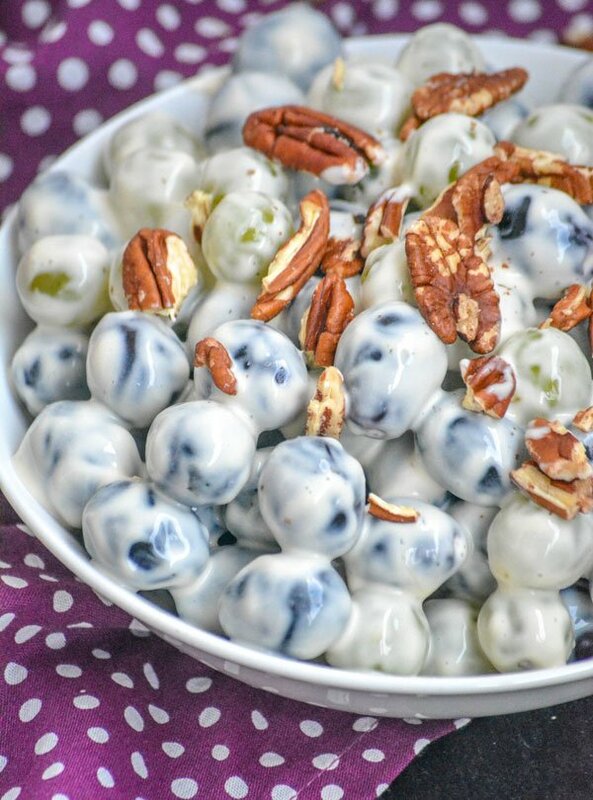 People have been making salad for centuries, and just as long they’ve been making sweet, fruit ‘salads’ too. 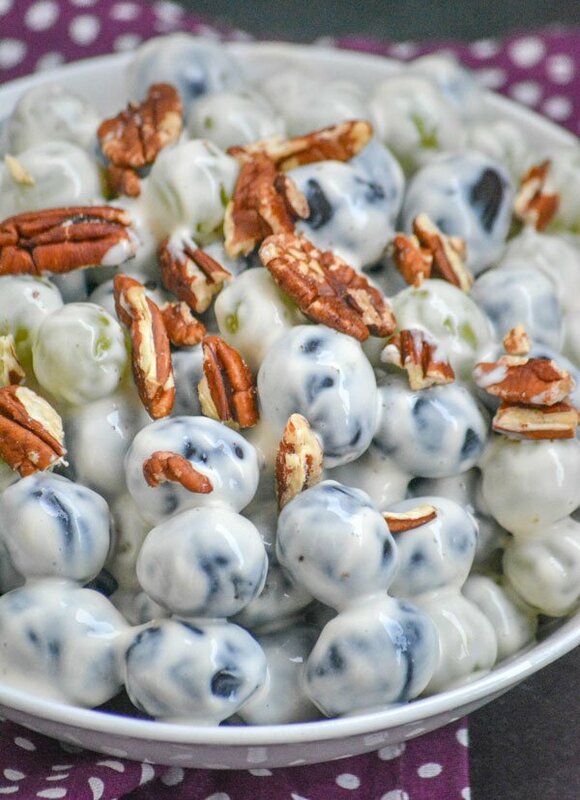 This Sweet Southern Sour Cream Grape Salad is a must try, and a vintage recipe that it’s beyond time to reintroduce to society and family gatherings. Make it for your next potluck or party, make it a tradition. 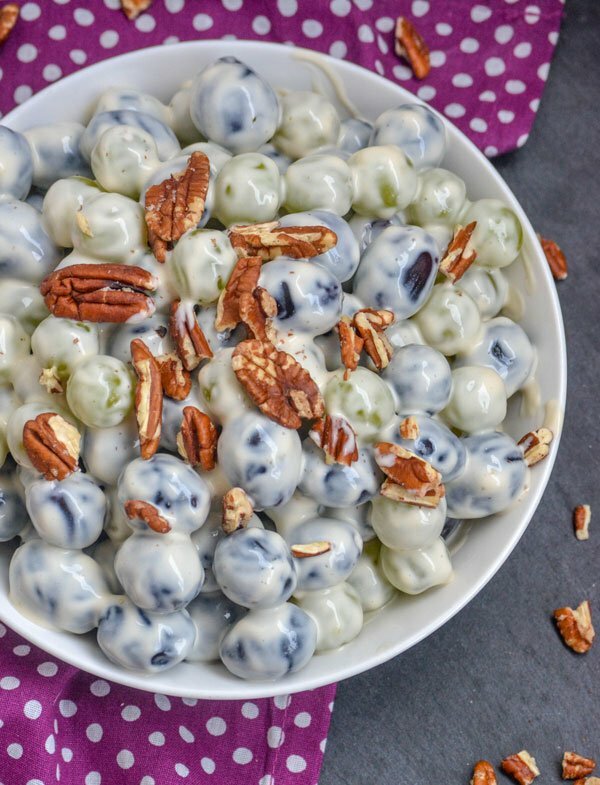 Put the grapes in a large mixing bowl. Set aside. To a blender, add the sour cream and brown sugar. Whip together, just until evenly combined. Use a spatula to stir the cream into the grapes, tossing carefully, to coat evenly, but without squishing any grapes. Cover, and refrigerate, until chilled & ready to serve. 1 hour, no more than 3. When ready to serve, transfer the grape salad to a serving bowl. Give everything a good stir, sprinkle with the pinch of salt, and then top with the chopped pecans. My mother used cream cheese instead of sour cream but I love both ,so I’m sure it’s fantastic!! I haven’t used cream cheese before, but I’m definitely gonna give it a try the next time we make this. Thanks for the suggestion!! This is a new one on me, but sounds delish. Bonus for simple and cool in the summer heat! Thanks for sharing with us at Fiesta Friday!